These labels are printed on durable hard plastic and enable students to apply the grammatical usage of the descriptive adjective to the definitions of various types of triangles. Dr Montessori devised this exercise to stimulate the child’s sense of observation and concentration with a study that integrates language and geometry. 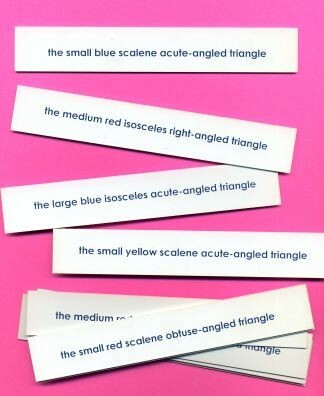 Like a detective, the student must understand the full meaning of each of the 63 printed description tags to find the matching figure among the 63 corresponding triangles (not included) differing in color, sides and angles. The printed notes of this Montessori presentation from our CME Teacher Preparation Course are available for purchase from this webpage. Please search for: Adjective Detective Game.